When I was 18 years old, I went to Paris for the first time and visited Notre Dame. It was the first cathedral I distinctly remember, and it was definitely the first Gothic Cathedral I visited. I have been to many more cathedrals since then and every time the physical and emotional effect is profound. I feel my breath slow, my voice drops to a whisper and I turn my thoughts inward. My aunt aptly described cathedrals as having the ability to simultaneously uplift and humble the visitor. Perhaps this is because we have been taught to have tremendous reverence for these spaces. However, research is also showing that there is more to this effect. 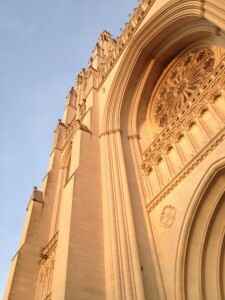 Designers have a term for what I am describing called the cathedral effect. In fact, a 2007 study published by the Journal of Consumer Research(PDF) explored the link between ceiling height in stores and the psychological effect on customers. Participants placed in rooms with 10 foot ceilings thought more freely, using expansive ideas. While, participants in rooms with 8 foot ceilings tended to focus on specific details. This and other related studies lead to a resurgence of rooms with high ceilings being used for creative teams. However, none of these studies reviewed the effect of extremely high ceilings, like those found in cathedrals. We know from the simple existence of cathedrals and great libraries, that architects and artists have used this effect long before it had a name. Frank Lloyd Wright would often speak about wanting people to occupy a space that would serve all of human spiritual life through ascetics. When we walk through those massive cathedral doors light, sound and even the air has changed quality. The massive stone footings arching gracefully as they reach for the sky draw the eyes and heart upward. The point at which it meets another footing bringing us again back to the ground creates a sense of order, through repetition, thereby creating a sense of ease. The play of light streaming through stained glass windows, intermingling with candle light and directional up-lighting softens our eyes. The smell of musty stone, incense, candle wax, burnt matches and wood oil permeate the senses. All these combine to create a distinct memory of solitude while being within a presence larger than any one person’s solitude. I have visited mosques, temples and cathedrals and the depth of experience is hard to neglect. For communities using these buildings regularly, the struggle is to make the space less intimidating and more intimate, without losing the tremendous gift of height and depth. For communities who could only wish for that kind of height, the trick is use the interplay of light, sound and smell to create the depth of experience. 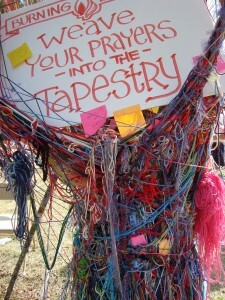 The trick is to curate the worship space with these experiences in mind. Frank Lloyd Wright reminded us that these experiences are not confined to specifically religious buildings. Many, many buildings have been designed to elicit just such a response as the one I experienced my first morning in Paris.